Have you ever wondered about what one needs to consider when it comes to video game music? 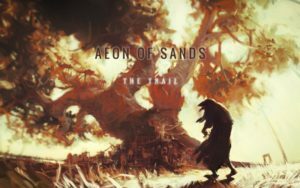 Then let me tell you about our creational journey to the music of Aeon of Sands and check out this blog post. Musical themes: the loopable melodic tunes that introduce the game, underscore encounters and take you out of the game and back to your room. Besides, we both wanted all the audio in the game to be very specific, convincing, direct, and most of all, musical. Given the particular narrative of the game, we also wanted its music to be not at all high fantasy or over-epic. In fact, the scope of the game story is not a fantasy of macho super-heroics stumping over the lives of a galaxy, or some stuff like that; it’s the story of a clerk, stumbling through things larger than him, and the story becomes broader only when he’s forced to confront his humanity in face of his own survival. Plus, add a little bit of humor. On the other end, we had a few examples in mind, something that came from our roots, like games we loved of the Commodore Amiga era: Perihelion, Elvira Mistress of the Dark, some pieces of Mass Effect for its coherence, and something even from the Commodore SID era as an inspiration. But we also wanted the bulk of it recorded live using analog tools and instruments, the same I (Marco) did for most of the audio effects. 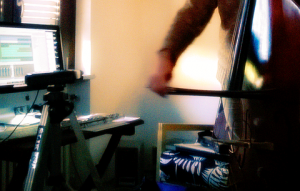 Enter Gabriele Artuso, our musician friend, who has collaborated with us on Aeon of Sands for the last three years. 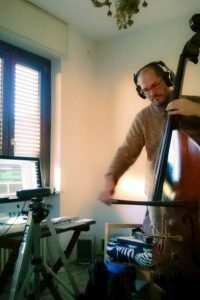 Gabriele added to the mix – besides his compositive experience – his taste for jazz improvisation and his exhilarating sense of experimentation. He did most of the real work, to which I added post-production and editing, contributing only a couple of tunes, just because his enthusiasm for this creation work touched me. The result of this fruitful confrontation is a set of almost forty tracks: tuneful ambient loops and direct groovy main tracks that echo back to John Carpenter’s ‘Eighties. All of these tracks you’ll be able to listen to in the game! Additionally, we are in the process of distilling the game’s tracks into a soundtrack to be released further on the road. And besides, if you have not yet done so, please add Aeon of Sands to your Steam wishlist! Setrani has no strength to object, and, from his curled position, half buried in the sand, accepts the water skin with a hoarse groan. Setrani peers from below at his saviour . A rover, from a city, thankfully, and not a nomad. Or else, he would probably be attached to a slave caravan, by now. Still, a rover, a man so resilient to walk the desert, scavenging his sustenance and finding items to sell back at a city, is just slightly safer than a nomad, in his view. Setrani nods at the man, and notices his sack. Only half empty. The clerk deflates, but refuses to admit that he’s indeed having a terrible time at this mission. Setrani’s mouth dries up again, considering his options. How is his death more likely today? In the open desert, with the little provisions he has, or following this man he doesn’t know anything about to a, what has he called it? A mine? What’s a mine? How could he possibly know they were cannibals? Besides, the man in front of him is not a nomad, so there is that, even if there’s no guarantee that he would not use him as sandcrawlers’ bait. The idea hits Setrani: what is unthinkable inside a city wall is very possible out here. He’s really new to these outlandish rules, but he’s learning. The man awaits an answer. What are the clerk’s options? 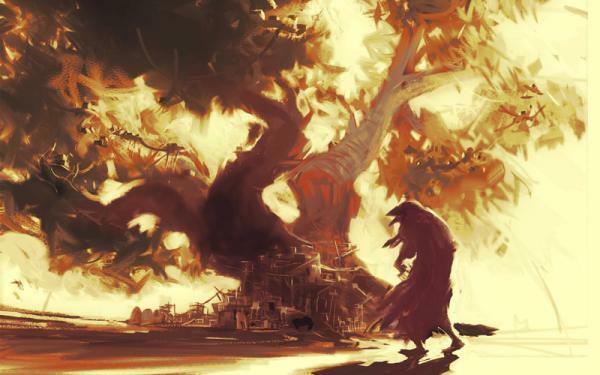 Whatever he chooses, he hardly will be able to retrace his steps, and the night, the very short night is coming, with all the fanged things that live in it. 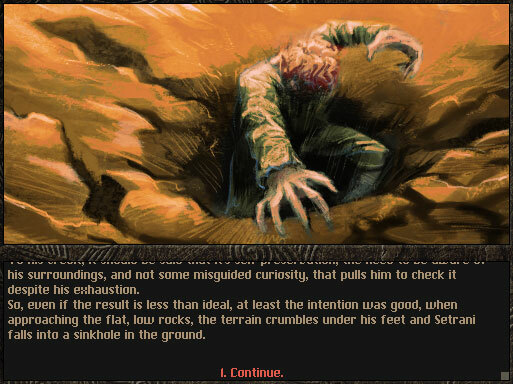 So you are asking, what is it like to play Aeon of Sands? You play a character that is as removed from the ambient he’s exploring as a city clerk in a dangerous desert: you know nothing about it and its customs, and you have an urge to survive. Therefore, you make decisions while not having a clue about the consequences: your only tools to navigate the adventure are your own morals as a compass, and the order of your priorities. Is it your survival first and then – perhaps – everyone else’s? Is it the greater good above your needs? Is it an ideal of law and civilisation that guides you, or the knowledge that nature must rightly overcome all men? Or are you comforted in the idea of a brotherhood of humans, with no distinction between cities and tribes? Whatever your path, the consequences have little to do with your skills or your statistics, and much to do with your choices, current and previous ones. It’s more a roleplaying adventure, at its core. And later this year 2018, you’ll be able to walk your own trail in Aeon of Sands! Add us to your Steam wishlist to be informed when the game is out! IRN : HOW LONG HAS THE DEVELOPMENT TAKEN SO FAR? Starting in 2012, about 2 years of research, planning, story and pipeline (how to get the exact old-school look and feel), followed by 3 years of implementation (code, graphics, gameplay, story, audio), and almost 1 year of beta-testing and polishing. Our plan is to release in 2018 ! We will disclose the release date in a few weeks on our blog; please do register for our newsletter if you want to be the first to know! If you want to write an article about Aeon, an interview, or you just want to let’s play it…please contact us at: info at aeonofsands.com . For this installment of “Sleep ’till late with Marco”, I’ll guide you in the process of Aeon of Sands – The Trail official videogame desktop wallpaper creation. The first requirement to create artwork is someone who asks or forces you to do it. Usually a perverted creature called co-worker who ignores the fact that you already have something to do: to recover from too little sleep, to buy food and to defend yourself against garden vines that try to enter your floor uninvited. This kind of thing. For proper illustration making, there are engagement rules to be respected. Evil Co-worker: We need a splash page. Me: We already have one, I call it “orange flat”. Him: No, I mean a proper one, with the Kinami tree… Have we already shown the tree? And the city… and the glass dome from the inside! And maybe tigers! A group of them attacking a pirate ship. In a stormy night! And the two Suns! Me: I see… Minimalism, Pop Art, the whole 20th century got nothing on you, right? Him: Don’t throw words at me! The only word is Code! After some other unjustified jokes associated with the threat that he would add heinous features to the game that only his distorted mind could love, like, more statistics, I give up, and for the sake of reason, I’ll make a few sketches that you see above. a figure in foreground to help me state the proportion of the scene, and most of all to give a sense of story, of a final destination reached, or of something about to happen. I thumbnailed a dozen possibilities, and decided for the one that seemed the most clear and sharply cut: a straightforward one. At that point, I usually want to have only a couple of values; in this case that was also seconding a scene overflown by the two suns’ light. I’m mostly concerned with shape and flow until very late in illustration, in any case. After that, I distanced the various planes a bit, and thought about the mood. In our story there is a kind of metaphorical veil, sometimes even a real one. A warm strangulation that threatens to suffocate the main character. This sometimes leads him in situations where right and wrong are blurred and Setrani, our leading actor, cannot help but miserably move on. 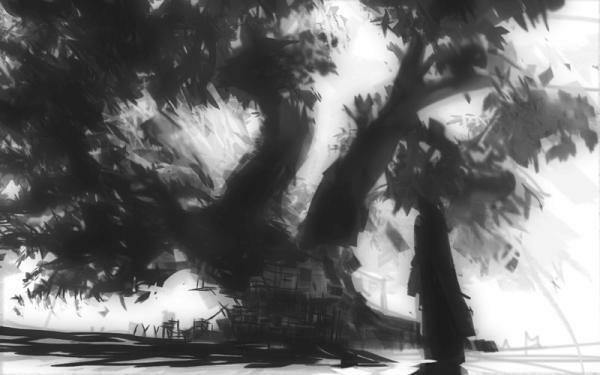 So, I started playing with that idea and the tree. The rough was ready, and I started to work on the preparatory drawing. I don’t need such drawings to be very precise in respect to line, but I do need that in respect to masses; I need to know what goes where precisely. I’m not the kind of visual artist that has the details fixed in mind from the start: I usually find them as I go on, as long as I have an expression, or emotion in mind, and a structure in place. Now for instance, the placeholder figure in foreground was really lame. I needed a clear purpose for it, beyond the simple balance of the image. So I borrowed a particular creature from the story, I covered it with a cloak, and gave it a sense of foreboding menace which fits with the general theme of the game. Then I started to paint it. A lot of clone-mix brush work and pencils later, I arrived the stage of the following screenshot. And even later, after adjusting the overall hue, adding detail and trying to pursue light diffraction and more distance separation, I came to the following one. Then, I had to add the game title that also called for a revision of the logo used for the normal advertising screenshots. Now I just had to add the shadows cast by the tree and by the figure on the ground, and add a bit of detail to it: grass, maybe a bit of farming for the sustenance of the city inhabitants. Finally I placed the logo on it, and added the finishing touches. If you like it, download it here in colossal [2560×1440] resolution for your desktop pleasure! Marco Pedrana, the more aerodynamic half of Two Bits Kid, artist, illustrator, narrator, designer, sleepwalker, I don’t actually have Setrani’ looks. This summer I will still be sludging through the opponents creation, trying to get a sense of what misses yet, or is out of place, in the growing and roaring sea of game assets. Here below, a 3 minutes video in which I illustrate the creation process of a creature, from the puppet sketch to the final frames of animation in game. As I mention on passing in there, the dirty puppet underlying the animation, and the time it requires to be cleaned out, are a necessity for my keeping together the creature, to be able to give it consistency with all its frames and all the other creatures; this imposed constraint is actually boring to keep with, but effective in avoiding me going away in 100 different directions at the same time. 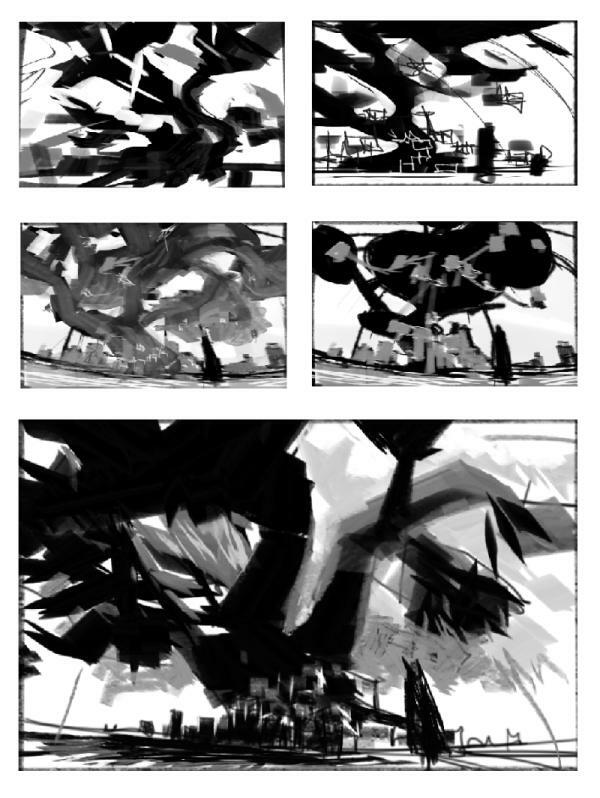 When I do not care for consistency, but only for expression, I would normally keep the puppet sketch – that encompass my understanding of the object – on one side, as a shorthand note, and do something only slightly related to it on a new page. What I found is that in game design, that almost never happen, sadly. As a result, this is the face of my dizzyness, that’s amazingly similar to the result of hitting yourself with a magic in game. Marco Pedrana, graphic slave of Two Bits Kid, artist. I don’t really have blue sparkles on my face.